If you work in a busy office with noisy colleagues and frequent interruptions, then you may see working from home – in relative peace and quiet – as a blissful alternative. However, if you work from home, you’ll also know that working in a familiar environment will present its own distractions. Distractions which may mean that sometimes you’re not as productive as you’d like to be. Dr B.J Fogg, a behavioural psychologist, suggests that one way to radically change your [unproductive] behaviour is to change your environment. While traditional, office-based workers have limited options on that front, home-based workers, like you, have the freedom to make changes to the work space. The changes you make should align your working environment with your basic, primal needs as a human being. This is because our caveman-esque instincts are often the reason why we behave in certain ways and are often the root cause of our productivity issues. If you (and your remote team) understand your primal needs and adjust your home-work environment to meet these needs, then you will likely become more productive. Compartmentalising is the dividing of something into categories. Emotional compartmentalisation (EC) is an evolutionary defence mechanism that humans use in survival situations. It involves an individual separating one thought from another to allow them to focus on a task. But people don’t just use EC in survival situations; they use it in their day-to-day lives as well. In the modern workplace many of us try to separate the ‘work’ and ‘life’ facets of our lives. Why? When our ‘personal’ identity or ‘work’ identity interferes with another aspect of our lives, it can be distracting and even damaging. Being an anywhere worker, you’ll likely find separating ‘work’ and ‘life’ particularly challenging.When you work from home, you have to work in an environment which you associate with rest and sociability. Switching off from this ‘personal’ environment and focusing on a work-related task can be challenging. So, how do you compartmentalise more effectively and increase your productivity at home? Start by compartmentalising physically; by categorising the different areas of your house. In our homes, we associate different rooms with different words or functions. The bedroom is for sleeping. The lounge is for socialising. The kitchen is for cooking and eating. We struggle to work in these rooms because we associate them with an activity other than work. And struggling against these associations can be distracting. So, as far as is possible, create a dedicated ‘work’ space in your house; a home-office room, or even a workstation that is only for work. By physically and emotionally compartmentalising rooms in the house for ‘play’ and ‘work’; you can switch off from one aspect of your life and focus on another. This way, you can literally shut the door to your ‘work’ life at the end of the day and experience the personal aspect of your life without distraction. Clearly, compartmentalisation is not just a primal survival tactic but a tactic to enhance enhance quality of life, too. Feng Shui is a Chinese philosophy that dictates the spatial arrangement and orientation of objects. One of the Feng Shui laws states that position your desk should be in for maximum productivity. 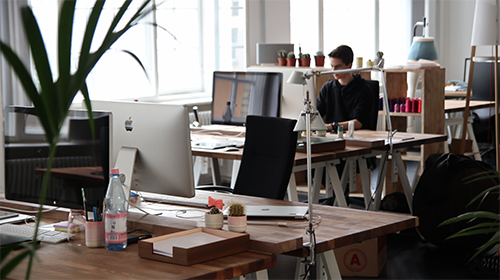 Why is your desk position so important? It’s all to do with your primal instincts. On a subconscious level, your position in the room dictates how vulnerable or powerful you feel. What is the ideal position for your desk? R.D Chin, Feng Shui master, architect and interior designer, states that the ideal position is the ‘command position’ because it is “very protective” and requires you to have a view of the door from your desk. And if you’re facing away from the doorway, you’ll have to look over your shoulder to see who’s coming into the room. From a primal point of view; if your back is exposed, you’ll feel more vulnerable and you’ll feel more open to attack. By having a view of who is entering the room, you’ll feel more powerful, more secure, less distracted and consequently, more productive. If you aren’t able to move your desk, then you could position a mirror by your desk in such a way that it will give you a view of the room’s doorway. Plants can reduce anxiety, boost happiness and increase productivity in an office environment. Again, Ron Friedman suggests that it’s all down to our primal instincts. Friedman is a psychologist and behaviour change expert who specialises in human motivation. On a subconscious level, we are drawn to environments which make us feel safer. Our forefathers associated ‘greenery’ with the abundance of life and survival. In addition to feeling safer, researchers argue that scenes of nature lower anxiety and muscle tension. And the less anxious we are, the more productive we are. Lead researcher at Cardiff University’s School of Psychology, Marlon Nieuwenhuis, highlights the impact that greenery can have on in-office productivity. He carried out experiments at two large commercial offices in the Netherlands and in the UK. If for any reason, you can’t have plants in your home-office, then include images of nature on your walls or make sure you have an view out your office window. Humans have evolved as diurnal creatures; we are awake during the daytime and are asleep at night. What causes us to sleep and how does this affect our productivity? The body’s circadian clock controls the body’s sleep cycle. It regulates the production of melatonin. In humans, melatonin has been thought to trigger sleep. Melatonin is known as a “sleep” or “darkness hormone.” When it gets dark outside, it sends signals to the brain, telling it to wind down for the day. The absence of light literally sends a critical signal to the body telling it that it is time to rest. Therefore, if people are working in poor lighting, it can make them tired and consequently, less productive. Clearly, natural sunlight can enhance productivity. So, how can you enhance natural light over your work space? Use mirrors in your home office. The more mirrors you have, the more light will bounce from wall to wall. If you don’t have any windows on your walls, consider a skylight. If your room isn’t receiving much sunlight, consider a SAD lamp. This can simulate sunlight and increase your mood. Primal need 1 – Compartmentalise: To enhance productivity, create a home office; a space dedicated to work at home. 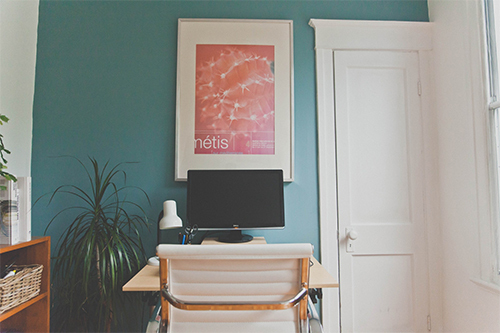 Primal need 2 – Command your space: Position your desk so that you have a view of the doorway. This way you will feel less vulnerable, less distracted and more productive. 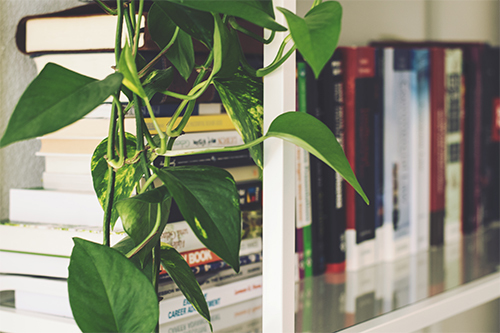 Primal need 3 – Go green: Put plants in your office, display pictures of nature or position your desk near a window to reduce anxiety and increase productivity. Primal need 4 – Add more sunlight to your life: Make yourself more awake and more productive by getting as much natural light into your work-space. Position your desk near a window; use mirrors to reflect light around the room; use skylights or use SAD lamps to lighten-up your workspace.